Marcie has a shiny new job. America’s reputation was redeemed overnight. The leaves are turning. The last Sizemore measure failed and Merkely defeated Smith. In one week we leave for Singapore. The trip is long, but virtually glitch-free, a friggin miracle considering our recent travel history. The only hiccup happens at the very end, checking in to the hotel; we are given the key to an occupied room. Embarrassing in the middle of the night. The room they find for us that night has two single beds and a terrible smell. We can’t even turn on the lights – eventually figure out you have to drop the key card into a slot on the wall to activate them. By afternoon they have a new room for us, a double bed and fresh as daisies, all is well. Before that, we get breakfast at the hotel’s buffet. Fried rice for breakfast? What a country! Also bao, noodles, and these delicious pancake-things like sweet and heavy nan. There is a guy who will cook you more westernized fare but we never bother. 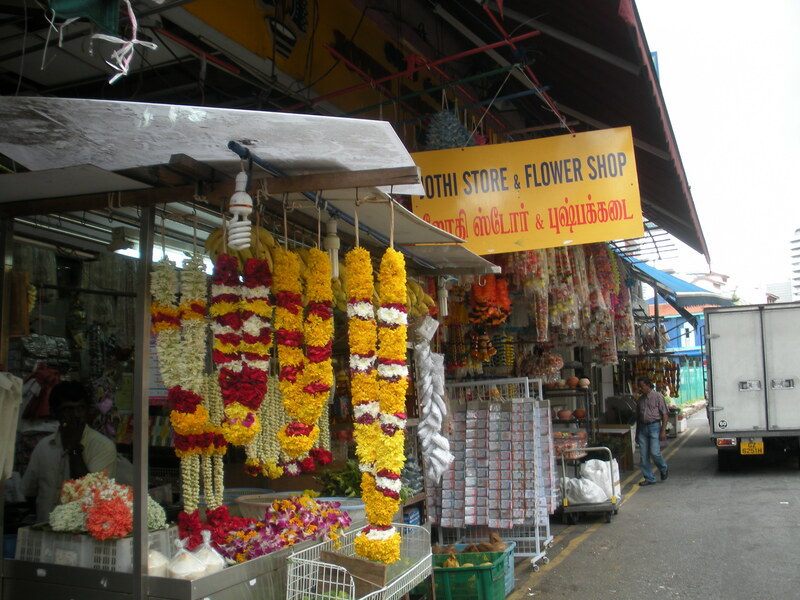 We buy 3-day MRT passes for the subway and busses, and head for Little India. Somewhere in the warren of tailors and trinkets and unfamiliar produce is a fabled spice shop, but we can’t find it. On our way back to the MRT station, the rain hits. It’s the rainy season, after all. Did we bring umbrellas? No. The rain starts out light and gentle, but escalates steadily. We stop under a tree, the lowest branches high above our heads and whatever drops make it through the leaves evaporate before they reach us. We can see it coming down harder and seek real shelter. Construction disrupts the walkways but we make it inside. Singapore has lots of huge buildings that enclose multiple independent entities. Many of these buildings are simply gargantuan malls, but not all of them. Our hotel, quite large and well-appointed, shares the building with another hotel. Does everyone want to get from place to place without going outside? That doesn’t seem likely. Most restaurants are largely open-air. I don’t know. I landed in Singapore in near total ignorance. The month-and-a-half leading up to the trip was my busiest time all year, and I was hard-pressed to get my lesson plans in order, let alone research our destination. Lucky for me Marcie came along. Anyway. Here we are in a long and winding enclosed space, hard to relate in American terms. It meanders, and construction breaks it up. We settle in a little lunch counter to wait out the storm. The sky is really unloading now, and we figure it can’t last more than an hour or so. We figured wrong. One giant Indian crepe and two excessively sweet sodas later it’s still coming down in kegs. We stand around for awhile in a large porch-like space, talk to a British couple who decided to travel the world for a year instead of redoing their kitchen, and finally decide to make a run for it. It’s only 100 feet or so to a covered area that connects to the subway. We get soaked, naturally. The sidewalk is flooded, and I’m kicking up as much bathwarm water as is falling on me. Once we’re back under cover we immediately find ourselves in a little convenience store with umbrellas. We buy two cheap ones, which we will carry with us everywhere and never need after today. Our next goal is a restaurant called The Coriander Leaf, which is offering a cooking class Marcie wants to take. It’s in a riverside shopping center called Clark Quay (pronounced “key:” if you ask a cab driver about the “kways,” he won’t know what you’re talking about). 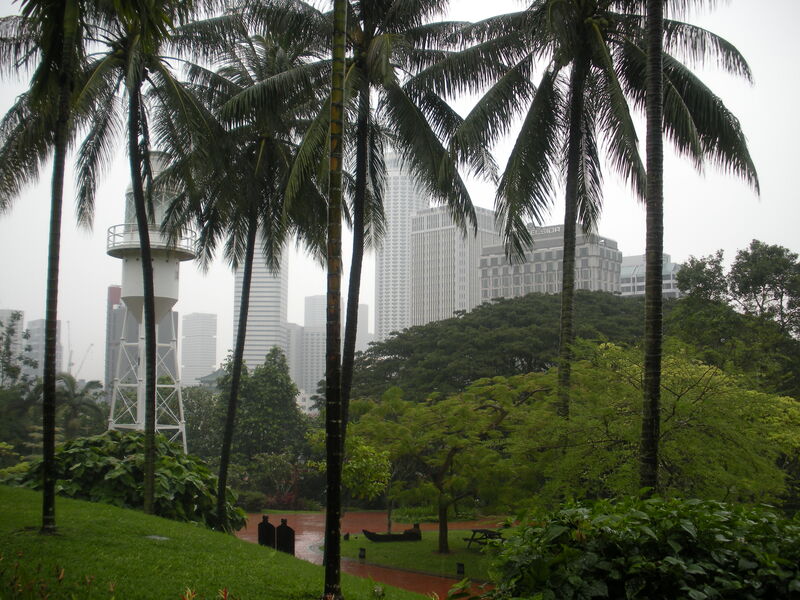 We take a wrong turn and end up in Fort Canning Park. No one else is around, because who goes to the park in a downpour? We climb a series of staircases to the top of the hill. The views are amazing. The trees are explosive. Eventually we make it to the quay, an almost Las Vegas-style string of malls and restaurants along the river. The open-air section is covered by gigantic umbrellas. Even so, the rain seems to be keeping everyone away. Sadly, the class at the Coriander Leaf has been cancelled. Next we head to Chinatown. More warrens of shops, temples of several persuasions, old men playing Go in the park. We track down the legendary hawker center for lunch. Singapore has lots of places like this; essentially a food court made up of kitchens the size of small storage sheds. Naturally we start with the biggest one, hundreds of vendors selling every variety of Asian food. It looks like all of them are independent, family-run businesses. KFC and Starbucks are all over Singapore, but not in the food centers, thankfully. The place is packed. It takes us a good 45 minutes just to get our bearings. The food is worth it. By this time it’s late afternoon and we are suffering sensory overload. We head back to our hotel, move into our new room and take a break. That night we have dinner in Chijmes, another open-air shopping/eating center. This one used to be a nunnery and orphanage. We have our first expensive meal in the restored courtyard and reflect on the irony only briefly. The Singapore Art Museum is scant blocks from our hotel. We walk over there this morning. The building is from the colonial period, more modest than the modern superstructures, all courtyards and passages and galleries. Currently it features an exhibition of Korean art. I didn’t get the names of any of the artists (just like a monolinguistic tourist. I’ll have a hell of a time with the names of my students tomorrow. I wonder what it’s like to be a native of this incredible melting pot, where names like “Ang Mo Kio” are as commonplace as “Fort Canning”), but the work is amazing. One room is dominated by a grid of wood blocks, each maybe 3 inches square, each one painted or mounting a cheap toy. Another room has the kind of recessed relief portrait that looks like a solid face that turns to follow you around the room, except these are full figures, life size, in a variety of poses. Also featured is Singapore painter Ong Kim Seng. His watercolor landscapes from a few decades ago are displayed next to recent photographs of the same site, showing how rapidly and thoroughly the face of Singapore changes. I get most excited about his ink drawings. There aren’t many– apparently the young, self-taught artist had to give up most of them to insulate the walls of the family home. They aren’t meant to be finished pieces, just studies for paintings. However they beautifully exemplify all the principles of cartooning I’ve been teaching this fall. I feel I should send my students in the upcoming workshop here, but I forget to mention it. Attached to the SAM is 8Q, a space for contemporary art. The installation by Tan Kaisyng– video projections on the walls, running figures that abruptly appear and disappear, sounds of mechanical chaos– is the most terrifying thing I’ve ever seen in a museum. Also unnerving is Donna Ong’s installation “The Caretaker,” with its cabinet graveyard of meticulously documented dolls. On the way back to our hotel is another food center, a fraction the size of the one in Chinatown, but still at least a couple dozen vendors. And busy. These food centers are everywhere. How do they all stay in business? I guess it’s because the population is 8 times denser than what I’m used to. Still, it never feels crowded, except in the food centers at lunch time. That afternoon we meet Regina, who made all the arrangements with me over email. She’s just as gracious in person. She and I take a taxi to the TV station for a brief radio interview. There is essentially one state-run media company that broadcasts all the local programming for tv and radio. The government has its hands in lots of things. But never fear, looney libertarians, it’s nothing like a repressive socialist regime. The whole place seems to run exceptionally well. Multiple ethnic groups and religions coexist peacefully and prosperously. Singapore’s small size may be to its advantage. Once you get too many people across too much territory, it becomes impossible to achieve consensus about anything. In the afternoon we take a bus to the zoo. There are free-range ouragutans in the trees above the walkway. I am mesmerized. There is also a large clan of chimpanzees and a huge colony of baboons. (I read later that the Singapore Zoo has the worlds largest collection of primates.) Lots of big cats too, which are more active than they tend to be in Oregon. We hear one of the lionesses roar. Next to the zoo is Night Safari, which opens after dark and features nocturnal animals. We have dinner at the park while the sun goes down. You see most of Night Safari on a tram, with commentary from a guide. At certain points you can get off and walk around, then get back on the next tram. On the walking loops we saw fishing cats, flapping bats, and a giant flying squirrel, big as Fizzgig (our 16 pound cat) leaping from one tree to another. Singapore is all about the night life, but we are not. After the bats and squirrels and tapirs we call it a night. One night we get out to the Seafood Center at East Coast Park and sample the national dish: chili crab. We aren’t sure how we’re supposed to eat it– the crab is in the shell and covered in sauce– so we dive in and make a huge mess and it’s delicious. Nearby is a water-skiing ring; handlebars hang down on cables that attach to an overhead track. You hang onto the handlebar and get pulled around on water-skis. There are ramps you can use, but everyone we see wipes out when they try them. After class on Wednesday, Marcie takes me to a comic shop she found. Looking for something I wouldn’t find at home, I get volumes 1 and 2 of The Resident Tourist by Troy Chin. It’s a (or perhaps the) Singaporean alternative autobio graphic novel. Reading it was like discovering an old friend who knows all the local touchstones. Why do we visit other countries? To see and do things we can’t see and do at home, sure, but we also want to engage with the culture on a meaningful level, which is not always possible. Chin’s story about returning to his country of origin after living in New York provides the perfect bridge. His books clued me in with an insider’s perspective on Singapore– or more accurately, an outsider insider’s perspective. Like pretty much every independent comic artist, Chin rejects a lot of the societal norms. As the title says, he’s both native and non-native at the same time. A kindred spirit to all us outsiders, and more revealing than any tour guide, and entertaining to boot. From now on, any time I visit another country, I will look for the local underground autobio graphic novelist. My class is over, and we’ve got one more day. There is an anime festival going on this weekend, so we hit that in the morning. It’s inside one of these gigantic multi-purpose superstructures. I’m hoping for more volumes of Deathnote, my newest manga addiction, but there’s hardly any manga or videos; toys and models dominate. I could easily fill a suitcase with toys, but limit myself to 3 modestly sized robots. The best part is the displays of storyboards and conceptual artwork. After that, we take a taxi to the island of Centosa, the southernmost part of Singapore and of continental Asia. (Even though it’s an island? Yes, that’s what we’re told.) We visit Underwater World, and the Butterfly & Insect Museum. Marcie gets the spa treatment where little fish chew on your feet, and I walk along the beach, which is basically a nonstop party. It’s fun and all, but a little sterile. The attractions could just as easily be in San Francisco. And that’s pretty much it. There was some talk about me coming back to teach another workshop. It’s too early to say whether that will happen, but I hope so.